After completely shattering the United Center with The DAMN. 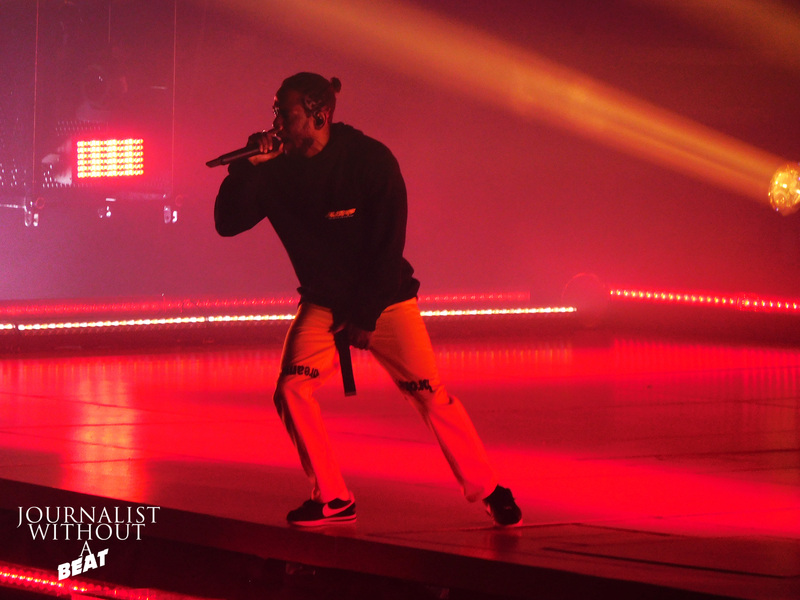 Tour in late July, Kendrick Lamar aka Kung Fu Kenny once again returned to the second city last night with what was nothing short of memorable. If you attended a show during the first phase, the flow and pacing of the show was about the same on this date, the only change was YG replacing Travis Scott on this leg of the tour. Kicking off the show was the charismatic D.R.A.M. who set the tone for the show. Next up was Compton’s rapper YG. There were a lot of elements to YG set. The first half featured the rapper performing tracks from both his albums My Krazy Life and Still Brazy and also 2009’s Toot It And Boot It. The second half saw YG bring out two exotic dancers (complete with stripper poles) to dance to the tune of Left, Right. At one point YG decided to vibe to a song in the audience, little did I know YG would come party in my section , section 122. For the duration of the song, YG kicked it with the fans, shaking hands and even letting some fans spit a verse on the mic. Before closing out to his set, an impersonator of the current occupant that resides at 1600 Pennsylvania Ave NW in Washington D.C took the stage and was met with loud boos. After kicking off the impersonator off the stage, YG finished with the crowd favorite FDT. As stated in my previous review of the tour, The DAMN, Tour is the tour to see in 2017. With this being my second viewing, The hype was still there and I wasn’t alone either – Moments before Kendrick took the stage, the crowd began to chant his name. One might think that maybe a performer would be tired and drained from doing almost 24 consecutive shows in a row – that would be further from the truth when speaking on Kendrick Lamar, the guy is on another level. From the looks of it, Kendrick had the same energy he had back in July. Kendrick Lamar’s set is about 2 hours in which he performs everything from Good Kid, M.A.A.D City to his current work of art, DAMN. to everything in between including untitled unmastered. The visuals are second to none combined with a unique and original narrative that keeps fans on their toes as you don’t know what’s coming next. Before closing, Kendrick took time to address Chicago and state that he always had a connection with the city. He even joked on himself when telling a story on how when he was young like most children, he wanted to grow up and be like Michael Jordan, but that didn’t happen as he is only made it to be 5’6. At the start of the set, the crowd was at a solid ten, and by the end of the show, Kung Fu Kenny would let it be known that Chicago crushed that 10 and made it a 20. Planning on going to the tour soon, or what to add the tracks to your playlist? See the setlist at the end of the page.